gorgeous little learning games & activities and of course I wanted to buy them all but I had bought so much already that I just had to stop looking! One particular little game made it all the way to the counter with me but while I was waiting to pay for it I had enough time to work out that I could probably make my own version - saving myself some money (I really had spent enough already) and allowing myself some fun "Martha" indulgence! 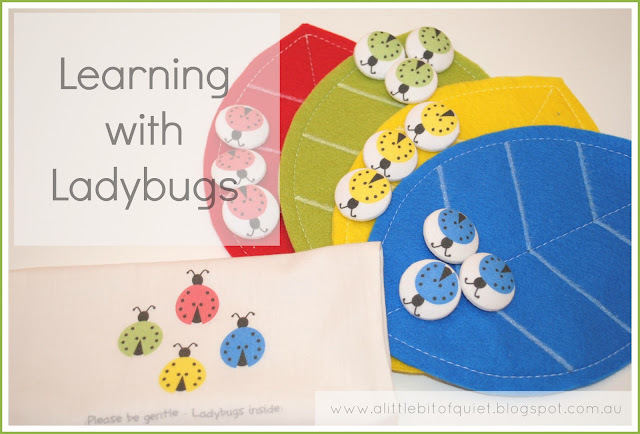 This is the little learning game that inspired me - a colourful and bright colour-matching game using ladybugs and leaves. It can also be used for simple sums - counting the bugs in and out of the bag - or for just plain old imaginative play - "look, the ladybugs are hiding under the leaves", "the ladybugs are going on an adventure" etc. So cutesy and fun - I was sold straight away. I made a basic little drawstring bag to contain it all otherwise the ladybugs would for sure fly off to foreign lands never to be seen again! Ladybugs printed directly onto the fabric! And that's it. I'm pretty sure it's the cutest little thing I have ever made. Now, for the very exciting, very clever, very sneaky "print on fabric" bit. It really is super easy and I have no idea why I haven't tried it before. You just cut up a piece of fabric (thin is preferable) to A4 size and stick it to a piece of A4 paper using spray adhesive. Make sure the fabric and paper are nicely stuck together with no bubbles. Pop it in your print tray and print. Ta da! You've just printed on fabric! Oh, think of the possibilities! And, because our little bugs are going to be well handled, I gave them a very light spray of hairspray to seal the ink otherwise it would probably end up rubbing off. So there you have it. A very cute, colourful, home-made "ladybug-love" learning activity perfect for little hands and minds. Do you think you would make something like this yourself? Please make sure you share if you do - I'd love to see your version! Hey there! I came over from the IHeart Organizing link up and found this post - brilliant idea to print on fabric! I've never tried that before, but I'm thinking I may need to now. Thanks for the tip! So cute! I'm going to pin this for a future project (next time we're learning about insects). Thanks for the info about printing on fabric. I've been wanting to experiment with that as well.